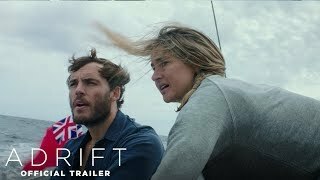 Starring Shailene Woodley (Fault in Our Stars, Divergent films) and Sam Claflin (Me Before You, The Hunger Games films), ADRIFT is based on the inspiring true story of two free spirits whose chance encounter leads them first to love, and then to the adventure of a lifetime. © 2018 STX Entertainment. All Rights Reserved.